Fox Cottage is an award winning Bach being honoured with NZ People’s Choice Bach Of the Year 2018, getting a Silver Award for Hospitality in 2018 and Bronze for Hospitality in 2016 from BookaBach. This was out of more than 14,000 listings! Opunake is located in Taranaki, voted the No.2 Best Region in the World by Lonely Planet in 2017. Situated on Surf Highway 45, Opunake is renowned for its world class surf breaks, beautiful beaches, artist studios and cosy cafes. Fox Cottage is a place where you can unwind, listen to the nearby stream, read a book in the sun, or stroll to the nearby township and beautiful beaches. It is very special, quirky and quaint, classic Kiwi Bach that sits on what used to be, the typical ¼ acre section in a tranquil setting, surrounded by native bush and birdlife. Built for the local Post Master in 1910 this gorgeous cottage features natural timbers, New Zealand art, quality furnishings and linen that create a relaxed and warm décor. The fully equipped kitchen has a great coffee machine and locally roasted Ozone Coffee with every stay. Complimentary Milo, tea, milk, eggs and other kitchen essentials are supplied. With the added bonus of a veggie and herb garden outside that you can help yourself too. There are modern technologies to make your stay comfortable and enjoyable with unlimited Wifi, a new Apple TV, Freeview and DVD player. On a sunny day outdoors, or rainy day inside by the fire, there is everything you need to keep entertained or just relax, hang out and rejuvenate. 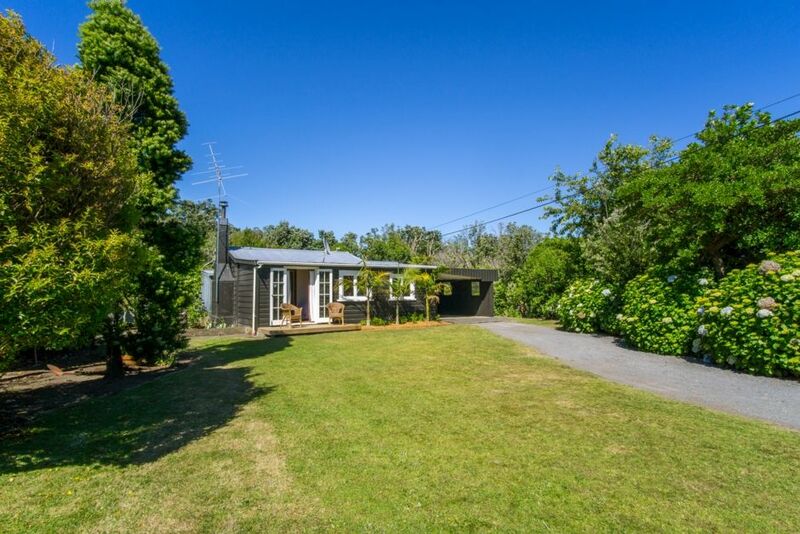 At the front of the section there is a grassy area for games, with a deck off the master bedroom to enjoy distant views of Mt Taranaki and your morning coffee. In the back part you have a private entertaining area, outdoor table with umbrella and a traditional wood-fired outdoor bath. Plus a shed with a Webber BBQ, deck chairs, washing machine, freezer, two bikes and kids body boards for your use. What an amazing place to come and just relax! Suitable for either a single person, couple, two couples or a couple with a child/adult or friend. Dinner by candlelight, champagne in the bath and movie in front of the fire… And by the way, we can organise a ‘Fox Cottage Romance Package’ if you want a romantic treat for you and your partner. Just remember to bring your sunblock, beach towels and your jandals. It doesn’t get much better than this. WARNING: You may not want to leave!! Pets allowed outside only and with prior approval. No parties or large gatherings. We are New Plymouth based young professionals that love the relaxed Opunake lifestyle. Thomas was born and raised in Opunake so having the opportunity to own a slice of paradise in his home town, that we can escape too (and that other people can enjoy) has been amazing. We absolutely love heritages houses and own a 1917 villa in New Plymouth that we are renovating. When we saw Fox Cottage come up for sale we both instantly knew we wanted it. The quirky features and large section surrounded by bush was what drew us too it. We hope you enjoy staying at Fox Cottage as much as we do. Perfect for a romantic getaway or making family memories. Walk to the beach or cuddle up by the fire. Wonderful stay thanks for all the lovely extras. I would absolutely love to have my own little Fox Cottage one day. Really lovely attention to detail. Best accommodation we have ever visited!!! Fox Cottage is a wonderful place to stay in the Taranaki area. When you arrive and open the door, you feel instantly at home in the warm and very welcoming cottage. Thomas and Greer have put great efforts to creating a cosy home by maintaining the original character of the cottage and giving it a modern touch. We especially loved the coffee machine and provided coffee from New Plymouth, as well as the outdoor bath tub which is heated with wood. Further, we highly appreciated the little personal touches in the cottage and the garden with fresh herbs. The bed was very comfortable with clean linen and towels, shampoo and soap were provided. Additionally, the cottage is very near to great beaches and walks and we could use two bikes and boogie boards for free to enjoy the day. Check-In and Check-Out was very easy and Thomas and Greer were easy to communicate with. Fox Cottage is THE perfect place to get away! We highly recommend it to everybody! Lovely place to stay with extras which give it the edge. Lovely linen, loads of towels, great coffee, private back yard. Bikes, Weber BBQ boogie boards and more. Great hosts, Thomas and Greer made our stay a perfect time. Very warm-hearted and supporting! Thank you very much!